Japan is famous for not only its extraordinary cuisine but also for satisfying anyone craving for something sweet. Especially Kansai, home to an abundance of traditional sweets from Kyoto as well as the new concoctions Osaka and Kobe can provide. Here's a quick rundown of the top five sweet omiyage (souvenir) options you can find in Kansai. Based out of Osaka, Rikuro Ojisan bakes the fluffiest and the bounciest cheesecake in Japan. Queues around the corner consistently form around all of their stores in Osaka as people scramble to purchase one of the freshly baked cakes. When you receive your cake, you'll see the famous logo of the bakery burnt into the top to confirm the authenticity of what you've just purchased. At first glance, the cake may seem too large to eat in one sitting, but once you dig in you'll realize that the moist, fluffy interior will prevent you from stopping. Keep in mind, if you plan to give the cheesecake to someone (or yourself), it only lasts a day or two refrigerated. Nama-yatsuhashi is a traditional sweet from Kyoto and is sold in many of the omiyage stores and local markets. This sweet is usually purchased for the purpose of giving it as a gift to others. There are two versions of the sweet: raw and baked. The raw version (生, nama) is the recommendation here as it provides the perfect combination of a soft and glutinous mochi exterior wrap and a sweet adzuki (red bean) paste inside. There are a few flavors to choose from but we say go for the matcha flavor where possible to keep with the Kyoto theme. Based on Baumkuchen, a popular cake from Germany, Kyo Baum has created its own take on the cake with its fusion concept. 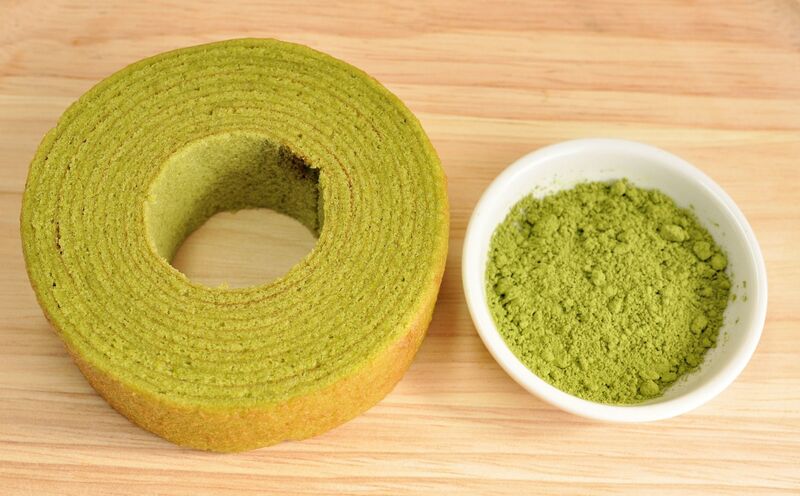 Using traditional ingredients from Kyoto, such as Uji green tea and soy milk, the cake is crumbly and sweet with a touch of green tea in the background. If you are looking to purchase a gift where West meets East, with the traditions of Japan baked into it, then look no further than Kyo Baum. This cake is only available for purchase in Kyoto (and selected shinkansen stations in Kansai) so it'll be a truly special gift for someone. Suhama dango is a great quick snack that you can purchase from Kyoto and Nara. This sweet dango (glutinous mochi balls) is unusual as the best-known dango are savory in flavor and drizzled in a thick, brown sauce. Despite its mochi texture, the sweet is not made from rice—but soy and starch, to give it its texture—and perfectly complements a relaxing cup of green tea. Named after the location where the head office is based, Mon-Cher makes one of the best roll cakes in Kansai. The Dojima roll is a thin layer of sponge cake that is wrapped around a heavy helping of cream. Various flavors are available to try at the bakery in Dojima, but try to go for the original roll. This makes a perfect gift for those visiting the Osaka region, but make sure that it's passed on to your friends or family soon as it will only last a few days in the refrigerator.